Yesterday I had the pleasure of spending the day at Umeå Institute of Design (where I did my MFA in Interaction Design). 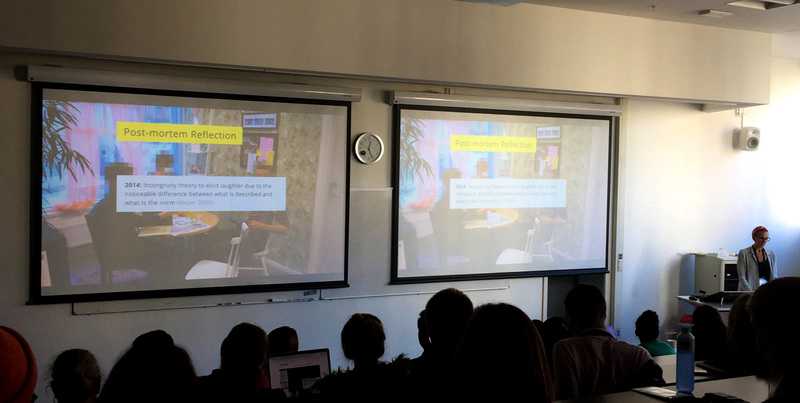 In the morning I spent a couple hours with upcoming IxD master thesis students to discuss my experience, and in the afternoon gave a talk titled “Crafting Humorous Fictions & Taboo Frictions” as part of the design school’s Wednesday lecture serious. Was great to be back, even if only for a day! Below is the abstract of my talk. Karey Helms is a PhD Student at KTH Royal Institute of Technology researching smart implicit interactions, those that are unseen or unnoticed yet proactively operate on our behalf. Her research through design approach includes speculative and autobiographical methods in which she designs humorous fictions and taboo frictions with intimate and somatic data to surface the social and societal implications of data-driven systems. These include the designing of fictional devices that predict when and how badly one has to urinate, and the prototyping of a genuine system to spy on her partner. In this talk, she traces back her playful approach to fiction and friction to her master’s thesis in Interaction Design at UID and how she employed this approach while working in industry delivering actualized services within enterprise IoT prior to beginning her PhD. The aim of this talk is to advocate for humor in design and to craft experiences that disrupt and disturb to not only provoke others to think, but also yourself as a designer. This entry was posted in AI / Machine Learning, Critical Design, Design Fiction, Human-computer Interaction, Humor in Design, Implicit Interaction, Interaction Design, KTH Royal Institute of Technology, PhD'ing, Thesis, Umeå Institute of Design on December 6, 2018 by admin. 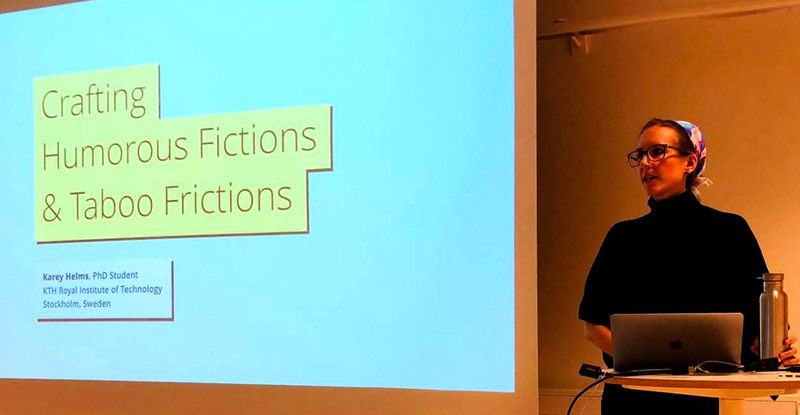 Early this week I presented a paper written with my PhD supervisor Ylva Fernaeus on the use of Humor in Design Fiction to Suspend Disbelief and Belief at NordiCHI 2018 in Oslo. This paper was part of the future scenarios track at NordiCHI, an excellent initiative and venue that explores the design of design fictions. Our paper contributed (1) a way in which humor might be used in design fiction (and design more broadly), (2) a design process that includes fieldwork to inform the design of design fictions, (3) and a human-scale design fiction as a method of communication and dissemination. For the presentation, I originally intended to role-play the paper presentation as a character from the fictional world, as I did when presenting the same project four years ago in Umeå as my master’s thesis, but last minute opted to not because of the opening introductions by moderators. Instead, I opened the presentation by jumping into the fiction with no context, and then gradually introduced more information and built reflections throughout the remaining of the presentation. I think this structure worked very well. The full paper is available here and the presentation below. This entry was posted in Conference, Design Fiction, Interaction Design, KTH Royal Institute of Technology, Presentation, Research, Sustainability, Umeå Institute of Design on October 5, 2018 by admin. Very excited to have a NordiCHI 2018 paper accepted in the future scenarios track! Written with Ylva Fernaues, my supervisor at KTH, the paper is about why and how I used humor in my MFA thesis at Umeå Institute of Design four years ago. Karey Helms, Ylva Fernaeus. 2018. Humor in Design Fiction to Suspend Disbelief and Belief. ACM Nordic Conference on Human-Computer Interaction (NordiCHI 2018), Oslo, Norway. This paper investigates humor as a resource and strategy for design with discourse as an intended outcome. While humor can incite empathy and understanding, it can also lead to alienation and disengagement. Through the detailing of the pre-narrative and narrative processes of an exemplar design fiction we describe why and how elements of humor, in particular puns, parody, and pastiche, were employed. Following the presentation of the fiction and its use in the design of an exhibition and diegetic prototypes, the paper presents responses from participants and audience members to reflect upon how humor was received within the design fiction. Following these reflections, as the near-future scenario was written four years prior to this paper and is now situated within present-day, it then concludes with a post-mortem reflection on the floating nature of humor. This entry was posted in Conference, Critical Design, Design Fiction, Human-computer Interaction, Interaction Design, KTH Royal Institute of Technology, Research, Sustainability, Thesis, Umeå Institute of Design on June 21, 2018 by admin. 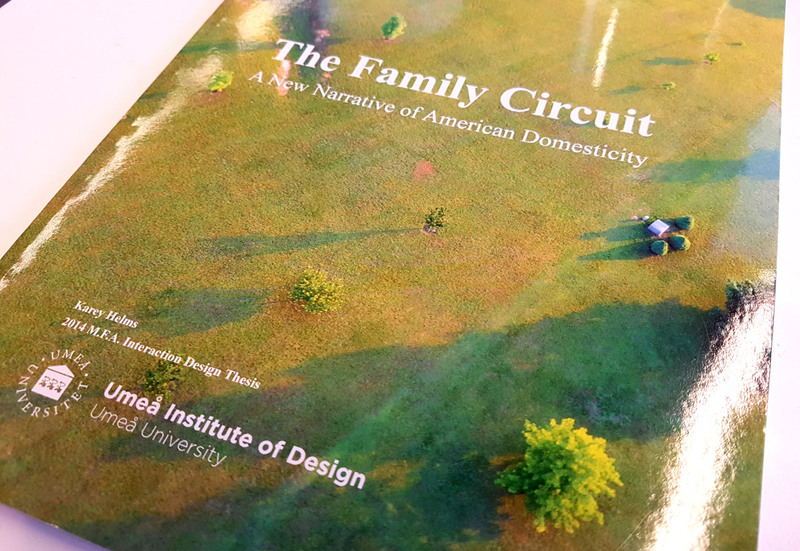 I was selected to exhibited and present my Interaction Design thesis project, The Family Circuit: A New Narrative of American Domesticity, with a group of other UID graduates for three days at Semcon in Göteborg, Sweden. This entry was posted in Critical Design, Design Fiction, Energy, Exhibition, Interaction Design, Presentation, Thesis, Umeå Institute of Design on June 28, 2014 by admin. First draft of my MFA thesis report has been ordered from blurb. PDF version available to download here. This entry was posted in Critical Design, Design Fiction, Energy, Interaction Design, Thesis, Umeå Institute of Design on May 30, 2014 by admin.